Ouch! On Christmas I burned my right hand on the stove. It really hurt! We've all been there. Fire is very beautiful but...oh how it can burn. This fire that burns so hot is also so great in refining...We can put gold and silver into the fire to refine it, to take out the impurities and make it more pure. 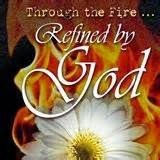 In comparison the Bible describes us being refined in the fire (Psalm 66:10). God purposely places us, His dearly loved children, in the fire of affliction, pain, despair...etc. Why? What could be His purpose? Well if we look at what fire does to gold we see the Master's purpose-it refines us, makes us more like Him, less like ourselves and our sinful nature. How does it do that exactly? So the things that really stick out in this verse is that first off God is the one that PUTS us into this fire. Yes, our loving God allows us to be tested and afflicted. And what happens is that His children TURN to HIM. Amen! Are you, in your pain, turning to Christ? He is there, waiting. He loves you and has a purpose in your pain! He is good all the time. Thanks be to the Lord that He hears our cry.